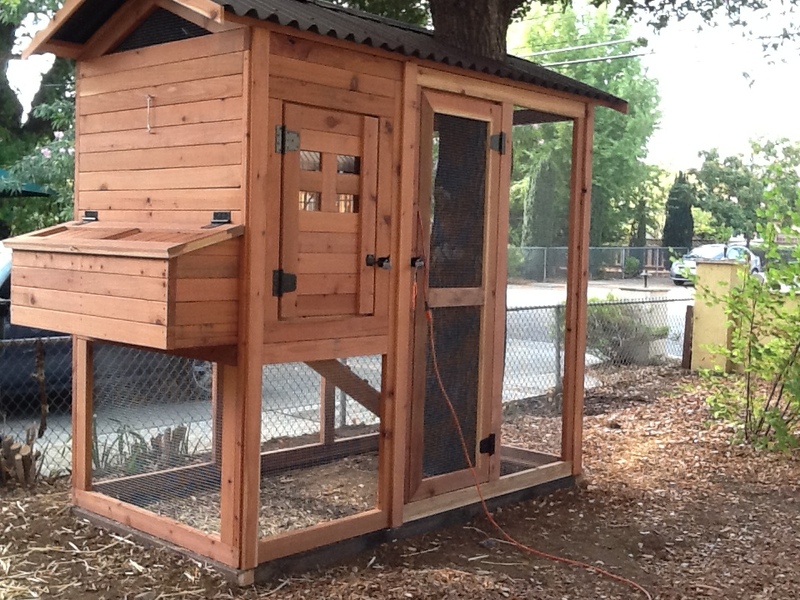 Our coop was just built this summer. We chose to put it in the front yard, where it has quickly become a neighborhood gathering spot. Everyone loves it, especially our hens! It is built around our oak tree, and we have added power to it so that we can keep our hens warm on the coldest winter nights and supplement the light for better laying in the darkest days of the winter. The design of our coop is unique not only because it is built around the oak tree in our front yard, but because a jackhammer was used to dig an 8-inch trench in order to lay 2×8 beams for the foundation. The henhouse, reminiscent of arts and crafts construction, is built with panels, so it can be (and now has been) expanded easily. It’s pretty, with a unique, attractive roofing material. I love being able to look out my kitchen window and seeing my hens! The henhouse has windows with glass and two laying boxes. Our hens are only 4 months old, so they haven’t started laying yet, but we expect to have home-made egg nog this Christmas. It’s in the front yard – it’s a neighborhood gathering spot. Everyone loves it! It’s built around our oak tree.